Adhesion- and degranulation-promoting adapter protein (ADAP) is required in TCR-induced activation and proliferation of peripheral T cells. Loss of ADAP also impairs TCR-initiated inside-out activation of the integrin LFA-1 (CD11a/CD18, αLβ2). In this study, we demonstrate that ADAP-deficient CD4/CD8 double-positive (DP) cells have a diminished ability to proliferate, and that these DP thymocytes up-regulate CD69 poorly in vivo. Moreover, in both MHC class I- and class II-restricted TCR transgenic models, loss of ADAP interferes with both positive and negative selection. ADAP deficiency also impairs the ability of transgene-bearing DP thymocytes to form conjugates with Ag-loaded presenting cells. These findings suggest that ADAP is critical for thymocyte development and selection. Development of a diverse and self-tolerant T cell repertoire begins in the thymus, where thymocytes expand, rearrange β- and α-chains of the TCR, and are selected for their fitness to become mature T cells (for reviews, see Refs. 1 and 2). Selection depends on TCR interactions with Ags presented by MHC on the surface of thymic stromal cells. TCR failure to recognize peptide/MHC results in “death by neglect,” while inappropriately strong signals trigger negative selection, the deletion of potentially autoreactive cells. A very small proportion of cells escape both of these apoptotic fates, having rearranged a TCR capable of recognizing peptide/MHC and transducing survival and maturation signals, a process known as positive selection. Although the precise receptor interactions and downstream signals involved in thymocyte development and selection have not been fully defined, several proximal TCR signaling molecules have been shown to be important (for review, see Ref. 1). One class of proteins shown to be critical for T cell development is adapter proteins (3, 4). Adapter proteins have no intrinsic enzymatic function and are thought to facilitate signal transduction by acting as molecular scaffolds upon which critical effector molecules are assembled. Several adapters, including Src homology 2 (SH2)3 domain-containing leukocyte protein of 76 kDa (SLP-76) (5, 6), linker for activation of T cells (LAT) (7), Gads (8), and Shc (9), have been shown to be central to TCR signaling as well as αβ thymocyte development and selection. Adhesion- and degranulation-promoting adapter protein (ADAP, formerly known as SLAP-130/Fyb) was originally cloned as a phosphoprotein that inducibly binds SLP-76 and the src-family kinase fyn upon TCR stimulation (10, 11). ADAP contains a large central proline-rich domain, an enabled vasodilator-stimulated phosphoprotein homology 1-binding domain (12), three putatively phosphorylated tyrosine residues, and a C-terminal SH3-like domain (11, 13, 14). Two isoforms, 120 and 130 kDa, differing by a single, differentially spliced exon of 138 bp, have thus far been identified (14). Early studies overexpressing ADAP in the Jurkat human T cell line implicated ADAP in TCR-induced IL-2 production (15, 16). ADAP has also been shown to be phosphorylated downstream of β1 integrin ligation in Jurkat (17). Recently, ADAP-deficient mice were generated (18, 19). These mice are viable, but they demonstrate moderate decreases in both thymocyte and T cell numbers. Upon TCR activation, ADAP-deficient peripheral T cells have intact proximal signaling but inefficiently up-regulate early activation Ags CD25 and CD69, fail to produce IL-2, and proliferate poorly in response to TCR stimulation. ADAP-deficient T cells also demonstrate impaired inside-out activation of integrins, with decreased clustering of LFA-1 and impaired adhesion to ICAM-1 upon TCR ligation. Given the decreased thymic cellularity of ADAP-deficient mice, the activation defects of ADAP-deficient peripheral T cells, and the critical role played by the ADAP binding partner SLP-76 in thymocyte development (5, 6), we have studied in vivo thymocyte development and selection in the absence of ADAP. We demonstrate here that ADAP-deficient CD4/CD8 double-positive (DP) cells have a diminished ability to proliferate and that these DP thymocytes up-regulate CD69 poorly in vivo. Moreover, in both MHC class I- and class II-restricted TCR transgenic models, loss of ADAP affects both positive and negative selection. Similar to ADAP-deficient peripheral T cells, ADAP-deficient thymocytes demonstrate no defects in activation of several key TCR-proximal signaling molecules. However, ADAP-deficient DP thymocytes form conjugates with Ag-loaded APCs less efficiently than wild-type cells. Collectively, these results indicate that ADAP is required for optimal passage through multiple thymic developmental checkpoints and that ADAP may modulate TCR-dependent adhesive functions that are critical for thymocyte development and selection. H-Y TCR transgenic mice (20) were obtained from Taconic Farms. AND TCR transgenic mice (21), B10.BR congenic, and B10.S congenic mice were obtained from The Jackson Laboratory. DO11.10 TCR transgenic mice (22) were obtained from the National Institutes of Health/Taconic Emerging Models Program. Generation of ADAP (SLAP-130/Fyb)-deficient animals has been described (18). H-Y, AND (H-2b), and DO11.10 TCR transgenic mice were intercrossed with ADAP-deficient mice and with congenic inbred B10.S mice to obtain H-2b H-Y TCR/ADAP−/−, H-2b AND TCR/ADAP−/−, H-2b/s AND TCR/ADAP−/−, H-2b/b DO11.10 TCR/ADAP−/−, and H-2d/d DO11.10 TCR/ADAP−/− mice. All TCR transgenic mice studied were hemizygous for the transgene. Pigeon cytochrome c (PCC 88–104, KAERADLIAYLKQATAK) and H-Y (KCSRNRQYL) peptides were synthesized by the Protein Chemistry Laboratory at the University of Pennsylvania. Spleen and lymph node cells were prepared in single-cell suspensions, as previously described, and RBC were lysed. Cells were resuspended at 1 × 108/ml in depletion buffer (PBS 5% FCS) and stained with anti-CD11b-FITC, anti-DX5-FITC, and anti-B220-FITC (BD Pharmingen). Cells were then washed three times in depletion buffer, mixed with 2 ml of Sheep Anti-Fluorescein Magnetic Beads (Qiagen), and incubated at room temperature for 15 min. Magnetic beads were removed from the mixture using the MPC-L magnet (Dynal Biotech). The supernatant was collected and found to contain 90–95% T cells by flow cytometric analysis. Cells were stained according to standard protocols using the following labeled Abs: anti-Vβ3-FITC, anti-H-2Ks-FITC, anti-CD3-FITC, anti-CD5-FITC, anti-CD24-FITC, anti-CD69-FITC, anti-Vα11-PE, anti-KJ1–26-PE, anti-CD5-PE, anti-CD24-PE, anti-CD69-PE, anti-CD25-PE, anti-CD44-CyChrome, anti-CD8-PerCP, anti-CD4-allophycocyanin, and anti-Thy1.2-allophycocyanin, all obtained from BD Pharmingen. Anti-T3.70-FITC was a gift from Dr. C. Thompson (University of Pennsylvania, Philadelphia, PA). Four-color flow cytometry was performed on a FACSCalibur (BD Biosciences). ADAP-deficient and wild-type littermates were i.p. injected with 200 μl of 4 mg/ml BrdU. Two hours later, a second i.p. injection was performed. One hour after the second injection, mice were sacrificed and their thymi removed. Staining for CD4, CD8, and CD3 was performed according to standard protocols, as described above. BrdU staining was performed using a FITC BrdU Flow kit (BD Pharmingen) per manufacturer’s instructions. LK 35.2 B cell lymphoma cells (23) were loaded with 10−8 to 10−5 M PCC peptide and stained with anti-B220-FITC and 2.4G2 for 1 h at 37°C. Thymocytes and peripheral T cells were isolated as described and stained with anti-CD8-PerCP, anti-CD4-allophycocyanin, and 2.4G2. Cells were washed twice in assay medium (RPMI 1640 10% FCS) and resuspended at 1 × 107 cells/ml. A total of 1 × 106 thymocytes or peripheral T cells were mixed with 1 × 106 LK 35.2 cells and centrifuged for 60 s at 4°C. Samples were incubated at 37°C for 12 min and stopped by addition of 300 μl of cold assay medium containing 0.2% sodium azide. Samples were analyzed by flow cytometry, and values shown indicate the proportion of thymocytes staining positive for B220-FITC, i.e., attached to an LK35.2 cell. Integrin-blocking studies were conducted using 10 μM anti-CD18 Ab (GAME-46; BD Pharmingen). Thymocytes were harvested from ADAP+/+ and ADAP−/− mice and resuspended in RPMI 1640 10% FCS. Cells were rested for 30 min at 4°C, then resuspended at 2 × 107 cells/ml in ice-cold RPMI 1640 10% FCS containing 5 μg/ml anti-CD3ε (500Α2; BD Pharmingen) or 200 ng/ml PMA or 1 mM pervanadate. Cells were incubated at 37°C for the indicated times, then harvested and lysed in 1% Nonidet P-40-containing protease and phosphatase inhibitors, as described previously (24). For immunoprecipitation, 1 × 107 cell equivalents of protein were incubated with polyclonal anti-SLP-76 Ab bound to GammaBind Plus (Pharmacia Biotech) beads for 4 h at 4°C. Beads were washed three times in 1 ml of 1% Nonidet P-40 and proteins eluted with standard reducing buffer. Lysates and immunoprecipitated proteins were resolved by standard SDS-PAGE protocol. Western blotting was performed using the following Abs: 4G10, anti-phospho-phospholipase C (PLC)γ1, anti-PLCγ1, and anti-phospho-ERK1/2 (Upstate Biotechnology), anti-ERK1/2 (Zymed Laboratories), and anti-SLP-76. Thymocytes were loaded with the cell permeant calcium indicator fura-2 AM (3.0 μM; Molecular Probes) in bicarbonate-free RPMI 1640 medium for 15 min at room temperature (25°C). During the final 10 min of fura-2-loading, biotinylated anti-CD3 and anti-CD4 mAb were added to lymphocyte suspensions. Cell suspensions were placed into the recording chamber on an inverted fluorescence microscope (Nikon) and adhered to poly-l-lysine (5 μg/ml; Sigma-Aldrich) treated coverslips for 5 min. Excess extracellular fura-2 AM and unbound Ab were washed from the microscope recording chamber with extracellular bath solution, which consisted of 155 mM NaCl, 4.5 mM KCl, 2 mM CaCl2, 1 mM MgCl2, 5 mM glucose, and 10 mM HEPES (pH 7.4). Calcium signaling was initiated by cross-linking biotinylated Abs with streptavidin. Differences in the avidity of receptor engagement were achieved by varying the concentration of streptavidin as previously described (25). fura-2 was excited with discrete bandwidth light (340 (10 nm), 380 (10 nm)) produced with a computer-controlled monochromator (TILL; Applied Scientific Imaging). Emitted fluorescence from fura-2-loaded cells was passed through a 470-nm long pass filter, and images were captured with an intensified charge coupled video camera (Hammamatsu Model C2400-68) connected to the side port of the inverted microscope. Four fluorescent video images were averaged and digitized (0.5 Hz) with a video frame grabber (Matrox; Dorval) using Metafluor acquisition and analysis software (Universal Imaging) and were analyzed off. Within cursor-defined areas of interest, paired 340/380 images were background subtracted and the ratio was calculated. The absolute ratio values in the cursor defined areas were exported into Microsoft Excel and converted to [Ca2+], as previously described (26). Calibration factors, Rmax (340/380 ratio obtained in presence of 5 μM ionomycin and 10 mM Ca2+), Rmin (340/380 ratio in presence of 5 μM ionomycin and excess EGTA), and F380max and F380min (minimum 510 nm emission with 380 nm excitation) were determined in situ. We (18) and others (19) have reported previously that mature (8-wk-old) ADAP-deficient mice have decreased thymic cellularity (60–80% of wild type). ADAP-deficient mice ranging in age from 2 to 14 wk display this decreased cellularity (data not shown). Analysis of these thymi by CD4/CD8 surface staining reveals that young ADAP-deficient animals (2–5 wk of age) have a higher percentage of CD4/CD8 double-negative (DN) cells and lower proportions of CD4 and CD8 single-positive (SP) cells than their wild-type littermate controls (Fig. 1⇓A). The absolute number of DN cells is similar between wild-type and ADAP-deficient animals, while the number of DP, CD4 SP, and CD8 SP thymocytes is significantly reduced (Table I⇓). ADAP-deficient DN cells have a normal distribution among DN subsets, based upon CD25 and CD44 staining (data not shown). Cell surface staining of CD4/CD8 DP and CD4 and CD8 SP cells demonstrates normal expression of CD3, CD5, and CD24 (heat-stable Ag; data not shown). Impaired thymocyte expansion and activation in ADAP-deficient mice. A, CD4/CD8 profiles of wild-type and ADAP-deficient thymi. B, Mice were injected with BrdU and thymocytes stained with anti-CD4, anti-CD8, anti-CD3, and anti-BrdU. Cells were gated on CD4highCD8highCD3low DP cells and examined for BrdU incorporation. C, DP cells were examined for CD3 expression (top panel). Gates indicate CD3low, CD3int, and CD3high subsets. CD69 expression was then examined on each of these subsets in both wild-type (lower left panel) and ADAP-deficient (lower right panel) mice. ADAP-deficient peripheral T cells demonstrate markedly reduced proliferation in response to CD3 ligation in vitro (18, 19). To assess DNA replication of ADAP-deficient thymocytes in vivo, wild-type and ADAP-deficient littermates were injected with BrdU and sacrificed 3 h later. In wild-type animals, 70–90% of early DP cells (CD4highCD8highCD3low) incorporated BrdU during the labeling period. In contrast, only 40–50% of ADAP-deficient early DP cells incorporated BrdU (Fig. 1⇑B). In addition, DAPI staining revealed that ADAP-deficient thymocytes survived normally when cultured ex vivo in the absence of stimulation (data not shown). These findings indicate that a smaller proportion of ADAP-deficient DP cells proliferates in response to early mitogenic signals, likely accounting for the reduced thymic cellularity in these animals. Expression of a signaling-competent αβ TCR on DP cells is accompanied by up-regulation of surface TCR, CD3, and CD69, and these cells can be divided into pre- and postselection populations based upon expression of these markers (27). The vast majority of DP cells fail positive selection and undergo apoptosis, but those that survive become CD3high and CD69+ (Fig. 1⇑C, lower left panel). Although the TCR/CD3 expression profile of ADAP-deficient DP thymocytes is normal, up-regulation of CD69 expression within the CD3high subset is reduced (Fig. 1⇑C, lower right panel), suggesting that positive selection may be impaired in the absence of ADAP. Because it is difficult to evaluate selection events in mice expressing polyclonal TCRs, we more closely investigated thymocyte selection in the absence of ADAP by breeding ADAP-deficient mice with those expressing the H-Y, the AND, or the DO11.10 TCR transgene. The H-Y TCR transgene is MHC class I-restricted and thymocytes are positively selected on H2Db in females (28). ADAP-deficient, H-Y transgenic female mice have a significantly greater proportion of DP thymocytes than their wild-type counterparts (78.1 ± 8.8% vs 53.6 ± 8.6%, p < 0.05, n = 4, Fig. 2⇓A). Similarly, the absolute number of DP thymocytes produced in ADAP-deficient H-Y transgenic females is consistently increased in these experiments, though this increase does not achieve statistical significance (Table I⇑). There is a consistent and corresponding decrease in both the proportion of ADAP-deficient CD8 SP thymocytes (5.2 ± 3% vs 16.5 ± 9.8%, p = 0.055, n = 4, Fig. 2⇓A) as well as their absolute number (Table I⇑), although neither value achieved statistical significance. Comparable percentages of ADAP-deficient and wild-type CD8 SP thymocytes express the H-Y transgene (identified by mAb T3.70, Fig. 2⇓B). No significant differences are noted in T3.70, CD5, CD69, or CD24 levels on DP or CD8 SP cells in wild-type vs ADAP-deficient females. Impaired DP to SP transition and positive selection in ADAP-deficient H-Y and AND TCR transgenic mice. A, CD4/CD8 profiles of wild-type and ADAP-deficient, H-Y transgenic female thymi. Numbers indicate percentage of cells falling within each quadrant. B, Profiles of DP and CD8 SP thymocytes stained with T3.70 (anti-clonotypic TCR Ab). C, CD4/CD8 profiles of wild-type and ADAP-deficient, AND transgenic, I-Ab-expressing thymi. Numbers indicate percentage of cells falling within each quadrant. D, Profiles of DP and CD4 SP thymocytes stained with anti-Vα11. E, CD4/CD8 profiles of wild-type and ADAP-deficient, DO11.10 transgenic, I-Ad-expressing thymi. Numbers indicate percentage of cells falling within each quadrant. F, Profiles of DP and CD4 SP thymocytes stained with anti-KJ1-26. To investigate the role of ADAP in positive selection further, we next examined ADAP-deficient mice expressing the AND TCR transgene. Positive selection of the AND TCR transgene (Vα11/Vβ3) occurs on endogenous peptides expressed within MHC class II I-Ab (21). ADAP-deficient, AND transgenic mice demonstrate a severe reduction in both the proportion (12.7 ± 6.2% vs 43 ± 15.6%, p < 0.05, n = 8, Fig. 2⇑C) and absolute number (Table I⇑) of CD4 SP thymocytes compared with wild type. We also observed compensatory increases in the proportion (76 ± 5.1% vs 42.6 ± 11.8%, p < 0.05) and absolute numbers (Table I⇑) of DP cells in ADAP-deficient mice. 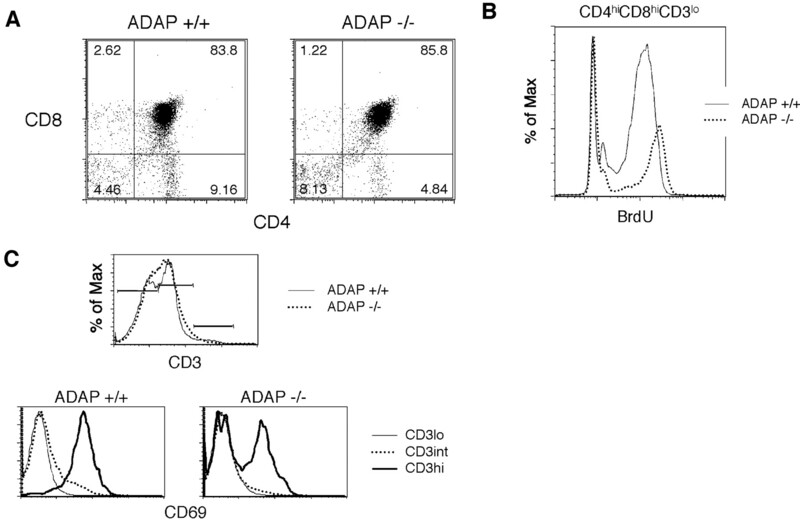 Furthermore, ADAP-deficient DP thymocytes express higher levels of CD4 and CD8 (Fig. 2⇑C) and lower levels of the TCR transgene (Fig. 2⇑D, top panel) than wild-type DP cells. These findings may reflect decreased DP “dulling” and delayed full up-regulation of the TCR associated with receipt of diminished TCR signals (27). In this instance, Vα11 staining on CD4 SP cells is similar between wild-type and ADAP-deficient animals (Fig. 2⇑D). No significant differences in total thymic cellularity (Table I⇑) or in surface expression of CD5, CD69, or CD24 (data not shown) in ADAP-deficient thymocytes were noted. Finally, we evaluated the effects of ADAP-deficiency on thymocyte development in a third TCR-transgenic system, DO11.10. Positive selection of the DO11.10 transgene (KJ1-26) occurs on endogenous peptides expressed within MHC class II I-Ad. Similar to results for the AND transgenic ADAP-deficient thymi, deficits were found in the proportion (17.6 ± 7.4% vs 23.9 ± 7.4%, p < 0.05, n = 4, Fig. 2⇑E) and absolute numbers of CD4 SP thymocytes produced (Table I⇑). As with mature AND transgenic, ADAP-deficient cells, expression of the clonotypic TCR on ADAP-deficient, DO11.10 transgenic CD4 SP cells (Fig. 2⇑F) and peripheral CD4+ T cells (data not shown) is normal. Thus, in two independent models of class II-restricted positive selection, ADAP deficiency results in impaired CD4 SP production. We evaluated TCR-dependent thymocyte clonal deletion in the absence of ADAP. Wild-type H-Y TCR transgene-bearing thymocytes are negatively selected in male mice before reaching the DP stage, such that the majority of thymocytes are DN (28). In contrast, the dominant thymocyte population in ADAP-deficient male animals is DP, representing transgene-expressing cells that have escaped negative selection (44 ± 8.2% vs 6.4 ± 2.8%, p < 0.05, n = 5, Fig. 3⇓A and Table I⇑). The ADAP-deficient DP cells express slightly lower levels of the TCR transgene than their wild-type counterparts (Fig. 3⇓B). These data suggest a defect in clonal deletion of ADAP-deficient H-Y transgenic male thymocytes. Impaired negative selection in ADAP-deficient H-Y and AND TCR transgenic mice. A, CD4/CD8 profiles of wild-type and ADAP-deficient, H-Y transgenic male thymi. Numbers indicate percentage of cells falling within each quadrant. B, Profiles of DP and CD8 SP thymocytes stained with T3.70. C, CD4/CD8 profiles of wild-type and ADAP-deficient, AND transgenic, I-Ab/s-expressing thymi. Numbers indicate percentage of cells falling within each quadrant. D, Profiles of DP and CD4 SP thymocytes and CD4+ T cells stained with anti-Vα11, anti-CD4, anti-CD69, and anti-CD3. E, CD4/CD8 profiles of wild-type and ADAP-deficient, DO11.10 transgenic, I-Ab-expressing thymi. Numbers indicate percentage of cells falling within each quadrant. F, Profiles of DP and CD4 SP thymocytes and CD4+ T cells stained with anti-KJ1-26, anti-CD5, anti-CD69, and anti-CD24. AND TCR transgenic T cells can be negatively selected on the MHC class II molecule I-As. In this MHC background, wild-type animals generate a large population of DN cells and ∼50% DP cells (21). Very few CD4 SP cells are produced in these thymi, and those that develop express endogenously rearranged TCRs. In contrast, the ADAP-deficient, AND transgenic, I-Ab/s thymus is comprised almost entirely of DP cells (89.1 ± 2.2% vs 51 ± 8.3%, p < 0.05, n = 4), reflecting failure of these cells to respond to an early negatively selecting stimulus (Fig. 3⇑C and Table I⇑). In analyzing the small number of cells maturing to the CD4 SP stage, we noted that a higher proportion of the ADAP-deficient cells express the TCR transgene and have a less activated and less mature surface phenotype based upon CD69 and CD24 expression. This distinction is magnified in the periphery, where we found that nearly all wild-type cells express endogenously rearranged TCRs, while among ADAP-deficient CD4+ T cells, those bearing intermediate levels of the transgenic Vα11 chain predominate (Fig. 3⇑D). Notably, TCR transgene expression levels among CD4 SP cells in this negatively selecting background are considerably lower than among peripheral wild-type or ADAP-deficient T cells positively selected on the I-Ab background. ADAP-deficient DO11.10 transgenic mice bred onto a negatively selecting background (I-Ab) also demonstrate impaired negative selection (Fig. 3⇑E). In this model, a sizable population of transgene-high CD4 SP thymocytes and CD4+ T cells, typically deleted in the wild-type animal, again persists in ADAP-deficient animals (Fig. 3⇑F). Therefore, using both class I- and class II-restricted TCR transgenic systems, we have demonstrated that negative selection of ADAP-deficient thymocytes is defective. Given the reduced thymic cellularity, impaired CD69 up-regulation in ADAP-deficient thymocytes, and inefficient positive and negative selection, we assessed the integrity of proximal TCR signaling in total thymocytes. Global tyrosine phosphorylation following CD3 ligation is unaffected by ADAP deficiency (Fig. 4⇓A). Of the numerous signaling molecules known to be important for TCR signaling and thymic selection, we have studied the activation of SLP-76, ERK, calcium, and PLCγ1 in wild-type vs ADAP-deficient thymocytes. In the absence of ADAP, TCR-induced phosphorylation of SLP-76 occurs normally (Fig. 4⇓B). Although ADAP-deficient thymocytes demonstrate activation defects at stages similar to thymocytes from mice with mutations impairing ERK1/2 signaling (29, 30), phosphorylation of ERK1/2 following CD3 ligation occurs normally in these cells (Fig. 4⇓C). TCR-dependent signaling in ADAP-deficient thymocytes. A, Normal global tyrosine phosphorylation in ADAP-deficient thymocytes. Cells were stimulated with 5 μg/ml anti-CD3 for the indicated times, lysed, and immunoblotted with antiphosphotyrosine (4G10). WCL indicates whole cell lysate. B, Normal phosphorylation of SLP-76 in ADAP-deficient thymocytes. Lysates from stimulated cells were immunoprecipitated with anti-SLP-76 and immunoblotted with 4G10 and with anti-SLP-76. C, Normal ERK1/2 phosphorylation in ADAP-deficient thymocytes. Lysates from stimulated cells were immunoblotted with anti-phospho-ERK1/2 and anti-ERK1/2. D, ADAP-deficient thymocytes display increased Ca2+ mobilization in response to anti-CD3 stimulation. Mean peak intracellular Ca2+ and subsequent steady state concentration were higher in ADAP-deficient cells for both high avidity (upper right histogram) and low avidity (lower right histogram) receptor engagement. Bar graphs show mean calcium concentration (plus 1 SEM of 50 individual cell concentration values) at peak (left) and plateau (right) phases of mobilization. Values of p represent results of unpaired Student’s t testing. E and F, Normal PLCγ1 phosphorylation in ADAP-deficient thymocytes. Lysates from stimulated cells were immunoprecipitated with anti-PLCγ1 and immunoblotted with either 4G10 (E) or anti-phospho-Y783 (F) or anti-PLCγ1. For F, the cells were first incubated with anti-CD3 mAb on ice, then hyper-cross-linked with hamster anti-mouse IgG at 37°C for the indicated times. We next examined TCR-stimulated calcium mobilization in thymocyte subsets. Using a ratiometric, flow cytometry-based method, we observed modest augmentation of initial TCR-stimulated changes in free cytoplasmic calcium in ADAP-deficient DP thymocytes (data not shown). To confirm and extend these results, we used fluorescence microscopy to assess single-cell intracellular Ca2+ concentration ([Ca2+]i) changes. These studies also found modestly enhanced TCR-dependent calcium mobilization in ADAP-null, DP thymocytes (Fig. 4⇑D). Although no significant differences were observed in the mean rates of increase or decrease in calcium concentration, the mean peak [Ca2+]i and subsequent steady state concentration were higher in ADAP-deficient cells under conditions of both high- and low-avidity (25) receptor engagement (Fig. 4⇑D, lower panels). Despite enhanced TCR-dependent calcium elevation in DP cells, there were no detectable differences in PLCγ1 tyrosine phosphorylation in ADAP-deficient thymocytes, either in global phosphorylation (Fig. 4⇑E) or in phosphorylation of tyrosine 783, modification of which is required for full hydrolytic activity of the enzyme (31)(Fig. 4⇑F). Collectively, these biochemical studies indicate that ADAP deficiency does not uncouple the TCR from key proximal signaling pathways. In fact, TCR stimulation appears to result in enhanced calcium responses. Initial reports of ADAP-deficient peripheral T cells noted defects in TCR-induced clustering of the β2 integrin LFA-1 (CD11a/CD18) and static adhesion to the LFA-1 ligand ICAM-1 (18, 19). Given the presence of LFA-1 in the immunologic synapse (32), we tested the ability of AND TCR transgenic, ADAP-deficient thymocytes to inducibly form Ag-dependent conjugates with LK35.2 B lymphoma cells. Wild-type and ADAP-deficient thymocytes show comparably low levels of adhesion to LK35.2 cells without peptide (PCC). 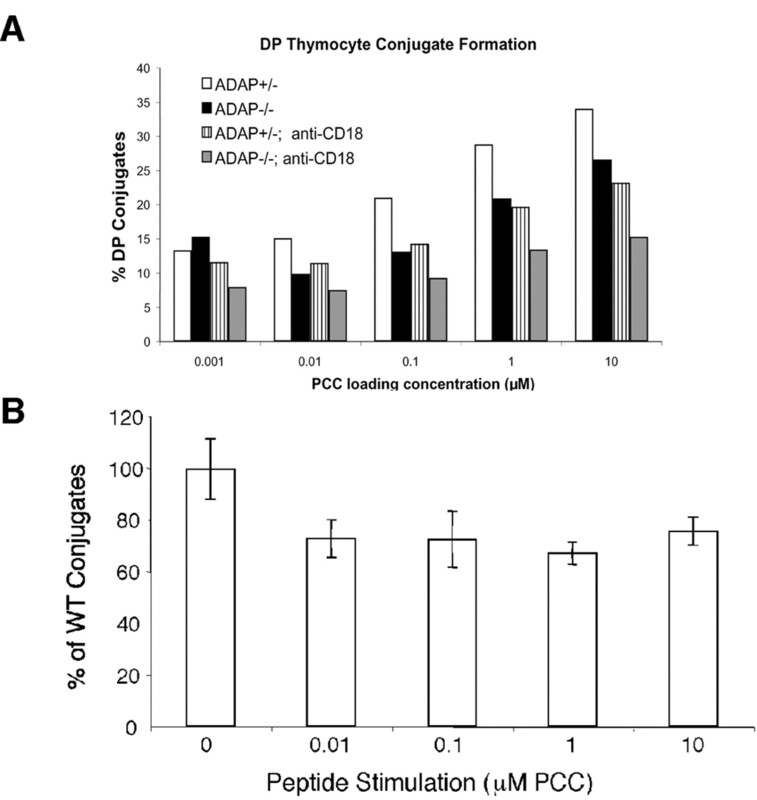 Although both wild-type and ADAP-deficient cells demonstrate dose-dependent conjugate formation with peptide-pulsed LK35.2 cells, the ADAP-deficient DP thymocytes achieve only 70–75% of wild-type levels of conjugate formation (Fig. 5⇓). Addition of anti-CD18 (β2 integrin) blocking Ab partially reduced conjugate formation in both wild-type and ADAP-deficient DP cells, consistent with prior demonstrations of integrin involvement in this process (33). Fig. 2⇑D demonstrates slightly lower TCRα expression on ADAP-deficient, AND transgenic DP cells than on wild-type, AND transgenic control cells. We attempted to minimize the effect of these differences in TCRα expression on conjugate formation by gating on wild-type and ADAP-deficient cells expressing similar levels of CD4 and CD8, which express similar levels of TCRα. Direct measurement of TCRα levels sterically inhibits conjugate formation. Defective TCR-induced conjugate formation among ADAP-deficient DP thymocytes is consistent with the impaired TCR-induced integrin activation observed for peripheral T cells (18, 19). Impaired conjugate formation ADAP-deficient, AND transgenic, I-Ab-expressing cells. A, ADAP-deficient DP thymocytes form conjugates with Ag-loaded tumor cells less efficiently than wild-type cells. Where indicated, conjugates were formed in the presence of β2 integrin blocking Ab (anti-CD18). Percentages indicate the proportion of DP cells that conjugate with LK35.2 cells. Figure represents one of five experiments. B, Statistical analysis of five conjugate experiments reveals that ADAP-deficient DP thymocytes form conjugates 25–30% less efficiently than wild-type cells across a wide range of Ag concentrations. Error bars represent the SE. These differences are statistically significant (p < 0.05) as evaluated by paired t test. We have demonstrated here the critical role that ADAP plays in several phases of thymic development. ADAP-deficient DP thymocytes show normal ex vivo survival but attenuated in vivo proliferation, which most likely accounts for the diminished thymic cellularity of the ADAP-deficient animal. Our studies with TCR transgenic models further show that the absence of ADAP results in inefficient positive selection of class II-restricted T cells, and in dramatically impaired negative selection. 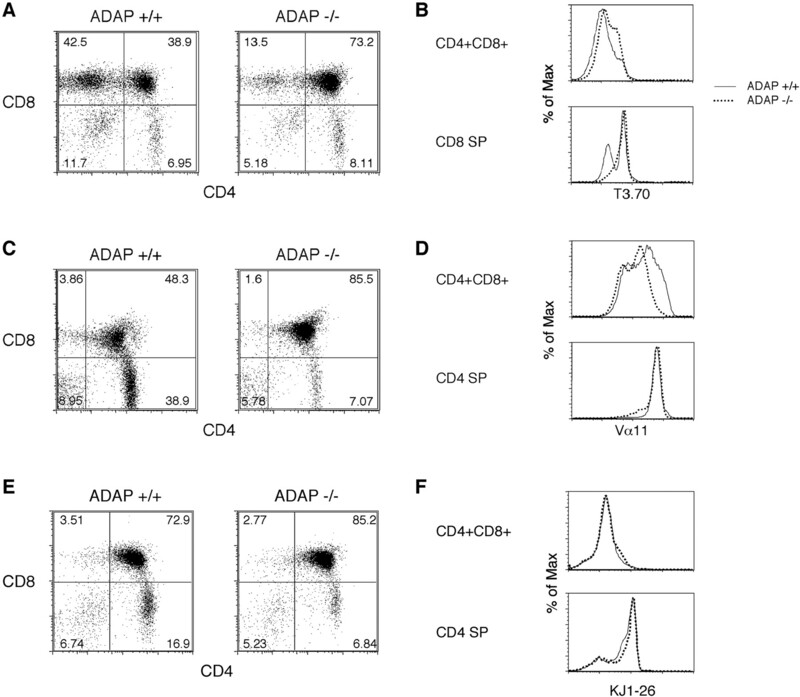 Failure of negative selection is manifested both as the presence of increased numbers of DP thymocytes in ADAP-deficient, male H-Y transgenic mice and the persistence of transgene-expressing CD4 SP thymocytes and CD4+ peripheral T cells in the ADAP-deficient, AND transgenic and DO11.10 transgenic negatively selecting animals. Although activation of several key TCR-proximal signaling molecules is intact in ADAP-deficient thymocytes, these cells demonstrate inefficient formation of conjugates with Ag-loaded APCs. 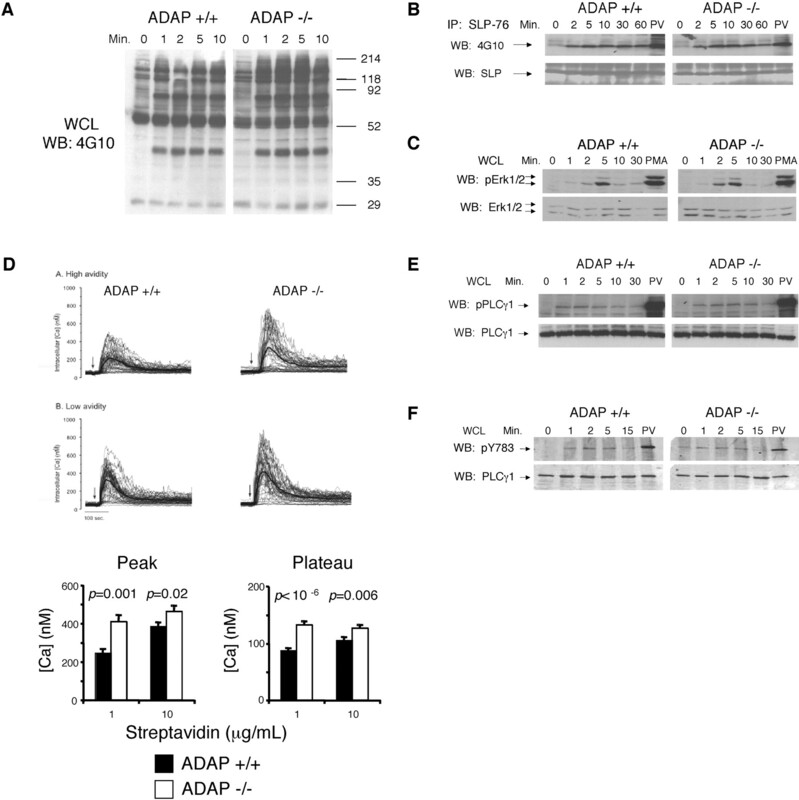 These results suggest that ADAP plays a key role in thymocyte development and selection, perhaps by mediating inside-out activation of integrins leading to thymocyte:APC conjugate formation. The earliest thymic selection events occur at the DN3 (CD44−CD25+) stage of development, when thymocytes first express a pre-TCR composed of the invariant pre-T-α-chain and a newly rearranged TCR β-chain (34). Cells that rearrange β-chains capable of supporting pre-TCR surface expression and signaling undergo numerous cell divisions and rearrangement of the TCR α-chain. Those cells that fail to transduce sufficient pre-TCR signals, either because of β-chain absence (TCRβ−/− (35)), inability to rearrange the β-chain (RAG−/− (36)), or lack of appropriate signaling machinery (i.e., lck−/− (37), SLP-76−/− (5, 6), LAT−/− (7), etc.) are developmentally arrested at the DN3 stage. ADAP-deficient thymocytes do not accumulate at the DN3 stage or DN4 stages, apparently undergoing β-selection and differentiating to early DP thymocytes normally. However, the proportion of ADAP-deficient early DP thymocytes that are dividing in vivo is lower than the proportion of cycling wild-type early DP thymocytes (Fig. 1⇑). As ADAP-deficient DP cells survive normally ex vivo, it is likely that this proliferation defect underlies the lower thymic cellularity seen in the ADAP-deficient mouse. A second indication of aberrant thymocyte development in polyclonal, ADAP-deficient mice is decreased up-regulation of CD69 as DP cells up-regulate TCR/CD3 in response to selecting signals. How signals received by a single receptor, the TCR, can lead to results as vastly different as positive and negative selection remains one of the most intriguing questions in immunology. One theory postulates that TCR signal transduction in positive selection is quantitatively distinct from that leading to negative selection (for review, see Ref. 38). Thus, the broad spectrum of TCR affinities produced by αβ TCR gene rearrangement can be roughly divided into three selection outcomes based upon the strength of the signal received by a developing thymocyte. Cells receiving very weak signals will undergo death by neglect, thereby failing positive selection. Cells receiving moderately strong signals will survive positive selection and mature, while those receiving very strong signals will be negatively selected. In this model of selection, it is the abilities of the TCR to discriminate between ligands of subtly different affinity/avidity and to transduce these different signal strengths through the same biochemical machinery that underlie selection of an appropriate T cell repertoire. One interpretation of the selection phenotype of ADAP-deficient thymocytes is that all TCR signals are moderately attenuated by the absence of this adapter protein. As a result, some signals that would normally result in positive selection, such as in the I-Ab-expressing AND transgenic mouse, now result in death by neglect. ADAP-deficient thymocytes that survive positive selection, though present in smaller proportions compared with wild type, express similar levels of cell surface markers CD3, CD5, CD24, and TCR transgene as their wild-type counterparts. This normal cell surface phenotype may reflect appropriate selection of cells that, despite having diminished TCR signaling in the absence of ADAP, still exceed the threshold required to avoid death by neglect. In the periphery, ADAP-deficient cells express moderately reduced levels of the AND TCR transgene and proliferate poorly in response to Ag-specific stimuli (data not shown). Whether these defects result from abnormal development and selection in the thymus or from continued reliance on ADAP for TCR signaling in the periphery is unclear. Diminution of TCR signal strength in a negatively selecting environment, such as in the H-Y transgenic male, the I-As-expressing AND transgenic mouse, and the I-Ab-expressing DO11.10 transgenic mouse, might result in conversion of a deleting stimulus into a positively selecting one. Indeed, a large proportion of the CD4+ peripheral cells in the negatively selecting, ADAP-deficient, AND or DO11.10 transgenic mice continue to express the transgene (Fig. 3⇑, D and F). Although findings from the TCR transgenic systems suggest that ADAP deficiency may diminish TCR signal strength in developing thymocytes, DP thymocytes from ADAP-deficient, nontransgenic mice activate several key downstream signaling molecules normally. Following CD3 ligation, global tyrosine phosphorylation, and activation of SLP-76, PLCγ1, and ERK1/2 are all intact in ADAP-deficient thymocytes. The lone biochemical indication identified thus far that TCR signaling may be altered by the absence of ADAP is an increased calcium flux following CD3 cross-linking of ADAP-deficient DP cells. This finding is surprising, given the positive regulatory role established for ADAP in peripheral T cell activation (18, 19). However, the enhanced calcium signaling in ADAP-deficient thymocytes is consistent with observations that thymocytes demonstrate distinct oscillatory patterns of calcium signaling that vary with the avidity of the TCR-MHC interaction (25). Thus, the enhanced sensitivity of this single-cell assay may permit detection of subtle signal alterations not apparent in our other assays. Efforts to determine the precise biochemical role of ADAP in inside-out signaling to the integrins and/or outside-in signaling through the integrins are ongoing. An alternative theory of thymocyte selection postulates that qualitatively different signals are received and transduced by cells destined for different fates. Several investigators have suggested that engagement of integrins may play important roles in both positive and negative selection (39, 40, 41). Costimulation of DP thymocytes by the LFA-1 ligand ICAM-1 can augment cell activation without enhancing cell death, thereby “opening a window” through which cells can be positively selected (42). Furthermore, in vivo Ab blockade of the LFA-1 α-chain CD11a inhibits negative selection of thymocytes bearing Vβ17a, a TCR that is normally deleted in C57Br mice (43). We have shown previously that ADAP-deficient peripheral T cells fail to cluster LFA-1 in the plasma membrane and do not inducibly adhere to an ICAM-1-coated surface following TCR ligation (18, 19). Consistent with a defect in TCR-induced integrin activation, ADAP-deficient DP thymocytes form conjugates with Ag-loaded B lymphoma cells less efficiently than wild-type cells. Interestingly, the LFA-1 blocking experiments illustrated in Fig. 5⇑A suggest both that there are LFA-1-independent mechanisms of thymocyte:APC conjugate formation and that ADAP contributes to conjugate formation in ways that do not involve LFA-1. Notably, the efficiency of conjugate formation among ADAP-deficient, AND transgenic CD4 SP thymocytes approaches that seen among wild-type cells, perhaps indicating that positive selection favors those cells able to overcome the integrin activation defect (data not shown). Whether TCR-induced integrin activation can be causally linked to thymocyte selection is still unclear. The potential connection between impaired integrin activation and inefficient positive and negative selection in the ADAP-deficient animal make this system an intriguing one in which to probe the importance of distinct costimulatory signals in determining cell fate decisions in the thymus. Future experiments will also address whether skewing of the T cell repertoire in the ADAP-deficient animals results in increased susceptibility to infection or to enhanced autoimmunity. We thank Martha Jordan, Connie Krawczyk, Terri Laufer, and Andrew Singer for valuable discussion and technical advice; Jacob Shabason for technical assistance; and Jonathan Maltzman and Xiao-ping Zhong for critical discussion and reading of the manuscript. ↵1 This work was supported by the National Institutes of Health (to B.D.F., G.A.K., and E.J.P), the Rheumatology Training Grant at the University of Pennsylvania (to J.N.W), and by the Arthritis Foundation (to E.J.P.). Support from the Abramson Family Cancer Research Institute is also gratefully acknowledged. ↵3 Abbreviations used in this paper: SH2, Src homology 2; SLP-76, SH2 domain-containing leukocyte protein of 76 kDa; LAT, linker for activation of T cells; ADAP, adhesion- and degranulation-promoting adapter protein; DP, double positive; PCC, pigeon cytochrome c; PLC, phospholipase C; DN, double negative; SP, single positive; [Ca2+]i, intracellular Ca2+ concentration. Starr, T. K., S. C. Jameson, K. A. Hogquist. 2003. Positive and negative selection of T cells. Annu. Rev. Immunol. 21: 139-176. Mariathasan, S., R. G. Jones, P. S. Ohashi. 1999. Signals involved in thymocyte positive and negative selection. Semin. Immunol. 11: 263-272. Jordan, M. S., A. L. Singer, G. A. Koretzky. 2003. Adaptors as central mediators of signal transduction in immune cells. Nat. Immunol. 4: 110-116. Samelson, L. E.. 2002. Signal transduction mediated by the T cell antigen receptor: the role of adapter proteins. Annu. Rev. Immunol. 20: 371-394. Clements, J. L., B. Yang, S. E. Ross-Barta, S. L. Eliason, R. F. Hrstka, R. A. Williamson, G. A. Koretzky. 1998. Requirement for the leukocyte-specific adapter protein SLP-76 for normal T cell development. Science 281: 416-419. Pivniouk, V., E. Tsitsikov, P. Swinton, G. Rathbun, F. W. Alt, R. S. Geha. 1998. Impaired viability and profound block in thymocyte development in mice lacking the adaptor protein SLP-76. Cell 94: 229-238. Zhang, W., C. L. Sommers, D. N. Burshtyn, C. C. Stebbins, J. B. DeJarnette, R. P. Trible, A. Grinberg, H. C. Tsay, H. M. Jacobs, C. M. Kessler, et al 1999. Essential role of LAT in T cell development. Immunity 10: 323-332. Yoder, J., C. Pham, Y. M. Iizuka, O. Kanagawa, S. K. Liu, J. McGlade, A. M. Cheng. 2001. Requirement for the SLP-76 adaptor GADS in T cell development. Science 291: 1987-1991. Zhang, L., V. Camerini, T. P. Bender, K. S. Ravichandran. 2002. A nonredundant role for the adapter protein Shc in thymic T cell development. Nat. Immunol. 3: 749-755. Musci, M., L. Hendricks-Taylor, D. Motto, M. Paskind, J. Kamens, C. Turck, G. Koretzky. 1997. Molecular cloning of SLAP-130, an SLP-76-associated substrate of the T cell antigen receptor-stimulated protein tyrosine kinases. J. Biol. Chem. 272: 11674-11677.
da Silva, A. J., Z. Li, C. de Vera, E. Canto, P. Findell, C. E. Rudd. 1997. Cloning of a novel T-cell protein FYB that binds FYN and SH2-domain- containing leukocyte protein 76 and modulates interleukin 2 production. Proc. Natl. Acad. Sci. USA 94: 7493-7498. Krause, M., A. S. Sechi, M. Konradt, D. Monner, F. B. Gertler, J. Wehland. 2000. Fyn-binding protein (Fyb)/SLP-76-associated protein (SLAP), Ena/vasodilator-stimulated phosphoprotein (VASP) proteins and the Arp2/3 complex link T cell receptor (TCR) signaling to the actin cytoskeleton. J. Cell Biol. 149: 181-194. Raab, M., H. Kang, A. da Silva, X. Zhu, C. E. Rudd. 1999. FYN-T-FYB-SLP-76 interactions define a T-cell receptor ζ/CD3-mediated tyrosine phosphorylation pathway that up-regulates interleukin 2 transcription in T-cells. J. Biol. Chem. 274: 21170-21179. Veale, M., M. Raab, Z. Li, A. J. da Silva, S. K. Kraeft, S. Weremowicz, C. C. Morton, C. E. Rudd. 1999. Novel isoform of lymphoid adaptor FYN-T-binding protein (FYB-130) interacts with SLP-76 and up-regulates interleukin 2 production. J. Biol. Chem. 274: 28427-28435. Boerth, N. J., B. A. Judd, G. A. Koretzky. 2000. Functional association between SLAP-130 and SLP-76 in Jurkat T cells. J. Biol. Chem. 275: 5143-5152. Geng, L., M. Raab, C. E. Rudd. 1999. Cutting edge: SLP-76 cooperativity with FYB/FYN-T in the up-regulation of TCR-driven IL-2 transcription requires SLP-76 binding to FYB at Tyr595 and Tyr651. J. Immunol. 163: 5753-5757. Hunter, A. J., N. Ottoson, N. Boerth, G. A. Koretzky, Y. Shimizu. 2000. Cutting edge: a novel function for the SLAP-130/FYB adapter protein in β1 integrin signaling and T lymphocyte migration. J. Immunol. 164: 1143-1147. Peterson, E. J., M. L. Woods, S. A. Dmowski, G. Derimanov, M. S. Jordan, J. N. Wu, P. S. Myung, Q. H. Liu, J. T. Pribila, B. D. Freedman, et al 2001. Coupling of the TCR to integrin activation by Slap-130/Fyb. Science 293: 2263-2265. Griffiths, E. K., C. Krawczyk, Y. Y. Kong, M. Raab, S. J. Hyduk, D. Bouchard, V. S. Chan, I. Kozieradzki, A. J. Oliveira-Dos-Santos, A. Wakeham, et al 2001. Positive regulation of T cell activation and integrin adhesion by the adapter Fyb/Slap. Science 293: 2260-2263. Kisielow, P., H. Bluthmann, U. D. Staerz, M. Steinmetz, H. von Boehmer. 1988. Tolerance in T-cell-receptor transgenic mice involves deletion of nonmature CD4+8+ thymocytes. Nature 333: 742-746. Kaye, J., M. L. Hsu, M. E. Sauron, S. C. Jameson, N. R. Gascoigne, S. M. Hedrick. 1989. Selective development of CD4+ T cells in transgenic mice expressing a class II MHC-restricted antigen receptor. Nature 341: 746-749. Murphy, K. M., A. B. Heimberger, D. Y. Loh. 1990. Induction by antigen of intrathymic apoptosis of CD4+CD8+TCRlo thymocytes in vivo. Science 250: 1720-1723. Kappler, J., J. White, D. Wegmann, E. Mustain, P. Marrack. 1982. Antigen presentation by Ia+ B cell hybridomas to H-2-restricted T cell hybridomas. Proc. Natl. Acad. Sci. USA 79: 3604-3607. Judd, B. A., P. S. Myung, A. Obergfell, E. E. Myers, A. M. Cheng, S. P. Watson, W. S. Pear, D. Allman, S. J. Shattil, G. A. Koretzky. 2002. Differential requirement for LAT and SLP-76 in GPVI versus T cell receptor signaling. J. Exp. Med. 195: 705-717. Freedman, B. D., Q. H. Liu, S. Somersan, M. I. Kotlikoff, J. A. Punt. 1999. Receptor avidity and costimulation specify the intracellular Ca2+ signaling pattern in CD4+CD8+ thymocytes. J. Exp. Med. 190: 943-952. Grynkiewicz, G., M. Poenie, R. Y. Tsien. 1985. A new generation of Ca2+ indicators with greatly improved fluorescence properties. J. Biol. Chem. 260: 3440-3450. Lucas, B., R. N. Germain. 1996. Unexpectedly complex regulation of CD4/CD8 coreceptor expression supports a revised model for CD4+CD8+ thymocyte differentiation. Immunity 5: 461-477.
von Boehmer, H.. 1990. Developmental biology of T cells in T cell-receptor transgenic mice. Annu. Rev. Immunol. 8: 531-536. Pages, G., S. Guerin, D. Grall, F. Bonino, A. Smith, F. Anjuere, P. Auberger, J. Pouyssegur. 1999. Defective thymocyte maturation in p44 MAP kinase (Erk 1) knockout mice. Science 286: 1374-1377. Mariathasan, S., S. S. Ho, A. Zakarian, P. S. Ohashi. 2000. Degree of ERK activation influences both positive and negative thymocyte selection. Eur. J. Immunol. 30: 1060-1068. Kim, H. K., J. W. Kim, A. Zilberstein, B. Margolis, J. G. Kim, J. Schlessinger, S. G. Rhee. 1991. PDGF stimulation of inositol phospholipid hydrolysis requires PLC-γ1 phosphorylation on tyrosine residues 783 and 1254. Cell 65: 435-441. Monks, C. R., B. A. Freiberg, H. Kupfer, N. Sciaky, A. Kupfer. 1998. Three-dimensional segregation of supramolecular activation clusters in T cells. Nature 395: 82-86. Krawczyk, C., K. Bachmaier, T. Sasaki, G. R. Jones, B. S. Snapper, D. Bouchard, I. Kozieradzki, S. P. Ohashi, W. F. Alt, M. J. Penninger. 2000. Cbl-b is a negative regulator of receptor clustering and raft aggregation in T cells. Immunity 13: 463-473. Michie, A. M., J. C. Zuniga-Pflucker. 2002. Regulation of thymocyte differentiation: pre-TCR signals and β-selection. Semin. Immunol. 14: 311-323. Mombaerts, P., A. R. Clarke, M. A. Rudnicki, J. Iacomini, S. Itohara, J. J. Lafaille, L. Wang, Y. Ichikawa, R. Jaenisch, M. L. Hooper, et al 1992. Mutations in T-cell antigen receptor genes α and β block thymocyte development at different stages. Nature 360: 225-231. Mombaerts, P., J. Iacomini, R. S. Johnson, K. Herrup, S. Tonegawa, V. E. Papaioannou. 1992. RAG-1-deficient mice have no mature B and T lymphocytes. Cell 68: 869-877. Molina, T. J., K. Kishihara, D. P. Siderovski, W. van Ewijk, A. Narendran, E. Timms, A. Wakeham, C. J. Paige, K. U. Hartmann, A. Veillette, et al 1992. Profound block in thymocyte development in mice lacking p56lck. Nature 357: 161-164. Hogquist, K. A.. 2001. Signal strength in thymic selection and lineage commitment. Curr. Opin. Immunol. 13: 225-231. Oliveira-dos-Santos, A. J., J. M. Penninger, T. Rieker-Geley, G. Matsumoto, T. M. Mak, G. Wick. 1998. Thymic heterotypic cellular complexes in gene-targeted mice with defined blocks in T cell development and adhesion molecule expression. Eur. J. Immunol. 28: 2882-2892. Prockop, S., H. T. Petrie. 2000. Cell migration and the anatomic control of thymocyte precursor differentiation. Semin. Immunol. 12: 435-444. Schmeissner, P. J., H. Xie, L. B. Smilenov, F. Shu, E. E. Marcantonio. 2001. Integrin functions play a key role in the differentiation of thymocytes in vivo. J. Immunol. 167: 3715-3724. Lucas, B., R. N. Germain. 2000. Opening a window on thymic positive selection: developmental changes in the influence of cosignaling by integrins and CD28 on selection events induced by TCR engagement. J. Immunol. 165: 1889-1895. Quddus, J., A. Kaplan, B. C. Richardson. 1994. Anti-CD11a prevents deletion of self-reactive T cells in neonatal C57BR mice. Immunology 82: 301-305. Vol. 176, No. 11.